The Swiss Chard needed help. A little bit of frostbite turned parts of the stems brown and some of the leaves looked more than a little wilted. These now short plants still manage to push out some brilliant leaves that I gratefully harvest every so many days. But this situation could not last much longer. We tackled the long talked of cold frame idea this past Saturday. We looked up a few different diagrams and plans, and settled on two possibilities. (There were tons more but these seemed the most helpful to us.) 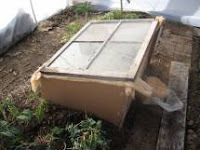 This cold frame description is helpful and describes what to watch out for and how a cold frame can be used. By far the simplest and most straight-forward explanation, this is the one we eventually decided to follow. 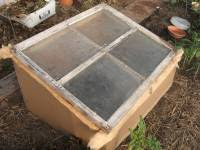 The Savvy Gardener offers a very nice description of cold frames and hot beds along with an assortment of building plans from the electric to the old window kind. I'd never heard the term hot bed before, but now I know that's what we were aiming for somewhat when we hauled in the horse manure. The site does a nice job explaining the wide variety of ways plants can be protected from the cold and how great a job each device does. The cold frame is meant to go inside the hoophouse to add an additional layer of protection for the Swiss Chard. Eliot Coleman, author of The Four Season Harvest, inspired this idea. (His cold frames and hoophouses are near works of art, whereas ours are a bit more equivalent to cheap knock-offs of name brands. They may not last as long, but for now they get the job done.) By having a cold frame inside the hoophouse the growing season for things like swiss chard, parsley, and other semi-sensitive greens is extended in some cases right through the coldest weather. We fashioned our cold frame from an old window a neighbor was throwing out, some old pipe insulation, and a cardboard box. We cut the cardboard to fit the window dimensions, angled the sides to drop and allow sunshine in, and used the insulation to offer a tighter seal between the window and the cardboard. We used cardboard because we were in a hurry, and we wanted a relatively safe test run before committing to wood. Plus, inside the hoophouse the cardboard won't break down very quickly at all.